The 2019 NEAGC Fee: $225 (Early Bird rate of $175 available until November 30, 2018) Registration will close on February 28, 2019 at 11:59 p.m.
Two full days of breakout sessions, networking with sponsors, presenters, and attendees, as well as several meals and refreshments throughout the conference. Lunch will be available on both days, breakfast will be served day 2. When booking your travel, plan to stay until the end of the conference for a chance to win one of two Apple iWatches. Up to 9 credits towards CFRE certification available. For more information or to be added to our email distribution list, please sign up now. Stephanie Rasamny | President, MainSpring Media Communications, Inc.
“Can you all just go run the annual fund while we do the real work of this institution?” Perhaps unspoken but the sentiment is there.It’s time to turn the tables. Garry will remind you that your work is central and the fuel for a five star student experience. She will offer actionable strategies to help you build a culture of philanthropy across your campus and will do so with practical advice, joy, humor and as a fierce champion for your success. If you would like to download the presentations from the 2019 conference to view for yourself and have the required password, click here. The Diane Thompson Award: Annual scholarship awarded to a senior annual giving professional who, in the opinion of the Northeast Annual Giving Association Executive Board, has exhibited excellence in annual giving practice and commitment to the profession. First presented in 2015, the award is named after Diane Thompson, the foundress of the Northeast Annual Giving Conference. 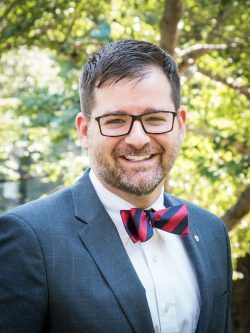 The Northeast Annual Gi ving Association is pleased to announce that the recipient of the Diane Thompson Award is Colin Hennessy, Associate Dean of Alumni Relations and Development for the Harris School of Public Policy at the University of Chicago. As Associate Dean and Chief Development Officer, he leads all initiatives to engage Harris alumni and deepen philanthropic relationships with Harris alumni, parents and friends. Before joining Harris Public Policy and the University of Chicago, Colin served as the Executive Director of The Penn Fund at the University of Pennsylvania where he oversaw the global undergraduate annual giving program and the largest of the University’s annual funds. Under his leadership, The Penn Fund steadily increased alumni donor participation and both unrestricted and endowed scholarship revenue to the University and gained national praise for collaboration with faculty on experimental fundraising design and testing. Prior to his role at Penn, Colin served as Associate Director of Annual Giving programs at the University of Iowa Center for Advancement, managing annual giving programs for Iowa’s 11 Colleges. In 2007, Colin was the inaugural recipient of the James A. Socknat Memorial Fellowship in Tertiary Education at The World Bank where he researched the use of information and communications technologies in the developing world. At Penn, Colin’s doctoral research explored undergraduate distance learning at institutions with traditional residential college model and outreach strategies for development and alumni relations with the goal of increasing lifetime philanthropic support. Colin earned his undergraduate degree at the University of Iowa and graduate degrees in education and public policy before earning his doctorate from the University of Pennsylvania.